One of the saddest moments in the whole anime series, is when in One Piece Ace dies. We don’t experience many deaths in One Piece, but when we do they are made to count. But who Portgas D Ace really was? The son of the pirate king Gol D Roger and his lover Portgas D Rouge. It is only logical he chose his mother’s name isn’t it? When the whole world were to make you a target because of your lineage, who wouldn’t hide their true identity? The original owner of the Mera Mera fruit, commander of the Second Division of the Whitebeard Pirates and former captain of the so called Spade Pirates. He was adopted and raised by the Marine Monkey D Garp, thus growing up with Luffy and Sabo. He actually became a brother of them and the rest is as they say history. Died because of his arrogance? Portgas D Ace was a strong pirate, no doubt. But can your strength in the end become your weakness? We all know the story. Marshall D Teach, aka Blackbeard kills his crew mate in order to steal the Yami Yami no Mi. The fact that this happened among his subordinates makes Ace leave the Whitebeard Pirates, in order to avenge the death of his subordinate Thatch and restore justice. He ignores his crew members’s and Shirohige’s advice to not pursue Teach. Their efforts to convince him were in vain. He was determined to make Blackbeard pay. Sadly, he underestimates Kurohige’s real power and overestimates his own. After all, Teach was hiding in the shadows all these years. As much as we love Ace as a character, his imprisonement leads to the Marineford war and his and Whitebeard’s death. Pursuing Kurohige without thinking too much about it, was the act that led to his demise. We had seen the pattern before. Luffy gets himself in a dire situation and Ace shows up to save the day. What happened in Alabasta was a glimpse into the future, only a darker one to be exact. The pattern gets reversed for a minute when Luffy storms into the war of the best. He was there to save his brother and nothing else mattered for him. After some epic battles and probably one of the best arcs in the history of anime(you know i’m not exaggerating :P), we finally watch Ace getting saved by Luffy and the others there. One of the most hated characters(at least for me :)) appears to get the pattern reversed once again and back to its original state. Akainu attacks with all his might and Ace does what we have seen him do several times. He gets the punch through his chest, only to save his beloved brother Luffy. Until the last moment, he loves his brother to the death. If we judge it cynically the two weaknesses that led to the tragic events of Marineford, were his arrogance and his weakness for his little brother, Monkey D Luffy. A big question did arise during the war of Marineford. Why was Law there and ended up saving Luffy? The first idea was that he just valued Straw Hat as a rival and realised the potential he had. Law made an investment in the Will of the D by saving him or understood that Luffy really valued his friends. Thus, Law rescued him and made Mugiwara become indebted to him. Or heck, he maybe just liked the guy! From now on we can only speculate. Why would Law risk being there in the middle of the havoc? Was an idiotic boy like Luffy really worth his investment? Lets think about the war. Why were so many Pirates and important characters there? Two reasons. The first to rescue Ace and the other to protect the Marine Headquarters. Two contradicting reasons that led to the war itself, they were in fact the gist of it. 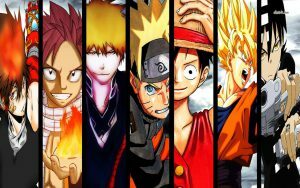 (Excluding the Red Hair Pirates and Shanks, who came there to stop the war–>pure epicness :D). So why would Law be different? 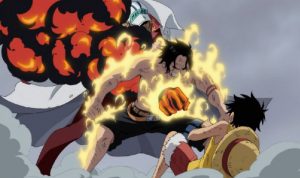 Assuming that Law wasn’t there for Luffy, could it be possible that he originally was in Marineford in order to save Ace? What was their connection then? I believe the only possible way they could have been connected was through Doflamingo. After all, Ace was the Captain of the Spade Pirates before he joined Whitebeard’s crew, which could refer to Joker, the Heart Pirates of Law and generally the card theme that exists around Doflamingo. There is a seat in Doflamingo’s palace with the symbol Spade as well. We didn’t see Ace in any Dressrosa flashback, but could there be a hidden connection with Ace lying ahead? What if Law just helped Luffy because he wasn’t able to help save Ace? Law witnessed the death of Ace and as a result decided to help Luffy out of compassion. Also, it is possible that he saw Corazon’s behavior at the actions of Ace, who sacrificed himself for Luffy, like Corazon did for Ace. One of the most shocking surprises in One Piece must have been when Sabo appeared again. A topic of a whole other post itself, but there is one important connection. 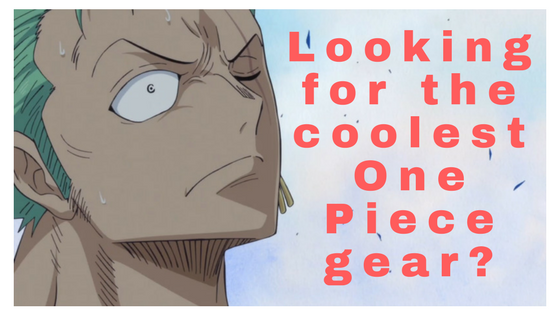 It seems like Sabo, by obtaining Ace’s fruit, became a memento of his brother. His will is going to carry on through Sabo. In essence, one brother died and the other one was resurrected. What is your opinion guys? I believe Portgas D Ace was one of the most beloved but also tragic characters in One Piece. The son of the Pirate King himself and one of the most promising characters when first introduced. We have laid out his personality and the reasons that motivated him to act. He was certainly overconfident and loved his brother Luffy more than anything. One of the most shocking moments in the anime, is when in One Piece Ace dies. Do you agree that his weaknesses led to his demise or is that just cynical? Do you believe that there can be a connection somewhere in the past between Law and Ace? Is it possible that Law was in Marineford in order to help save him and not Luffy? Can Sabo carry on his will? Hello Gus! It really is worth it catching up with One Piece, you won’t regret it ;). What other anime/manga do you enjoy? Great theory Antonis, pride is what costed our beloved ACE his life. May Sabo inherit his will and avenge his death! I think after reading this that I should give it a go. See I am still quite new to anime (I started watching in 2014). I did you to watch the old stuff like Pokemon, Yu-Gi-Yo etc, but I only started watching anime after I found Death Note (Best Anime Ever xD). What’s your favourite anime of all time? Hey Anthony! Loved Pekemon and Yu-Gi-Oh as a child. Like Death Note too till the middle of it :P. My favorite pick of all time besides One Piece would have to be Code Geass. Cheers! Great idea to add videos in your articles, so that we can remember the scene it’s written about! Thanks Kate, i believe it’s a good reminder and a nice way to make the readers stay more to the site :). Really happy you like it. I also thought the same, since anime are visual by nature.